The practical wagon for school and preschool! The Rambler outdoor wagon is the ideal wagon for excursions and trips for school and preschool. Children love to be outdoors, trips to the park or playground, vegetable garden or school excursion. The Rambler outdoor wagon is the perfect wagon for carrying children and luggage. Great for children who are less mobile or soon tired and need a resting place every now and then. Useful as a group meeting point! All Rambler outdoor wagons are of course child-friendly and robust. In addition, the outdoor wagon is foldable, thus saving space storing or taking in the trunk. Easy to take in the car or train! The unique design of the Rambler outdoor wagons reduces the physical strain for pulling the wagon to a minimum. With the optional push bars for a 2nd person the stroller is even easier to move. The strollers roll smoothly over any type of terrain. 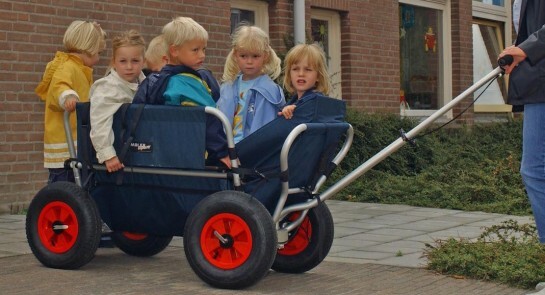 The ideal outdoor wagon for school and preschool! Wagon up to 5 children. Including back board.